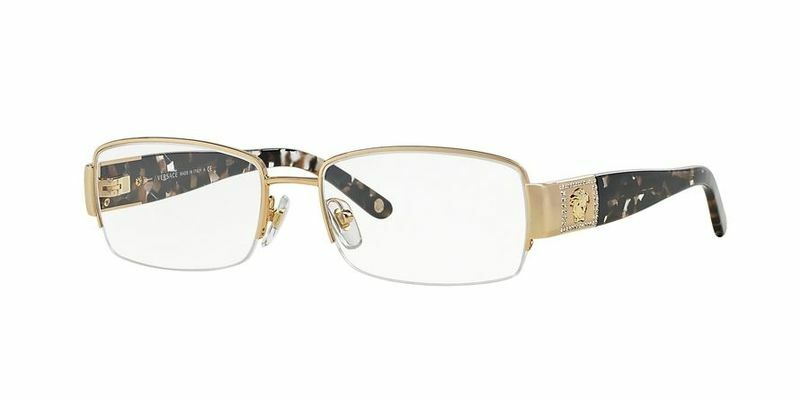 These plastic and metal Versace VE1175B frames won't disappoint. Wear them every day without any irritation. They're light and strong, allowing you to wear them wherever you go. They're perfect for a person who likes to make a statement without standing out in the crowd too much. If you enjoy fashion and the finer things in life, choose a pair of practical eyeglasses frames that are both reinforced and decorative. Semi-rimless glasses are sleek in their design. A popular choice amongst businesspeople and other working professionals, you'll be able to add a little more authority to your professional look without compromising your lenses. Show your personality through your frames with these comfortable rectangular shaped Versace VE1175B glasses that mold perfectly to the face. Show them that you mean business, but also let them see you've got a more playful side at the same time. You'll never have to adjust these comfortable medium temple Versace VE1175B frames - they sit perfectly, and at times, you'll forget you're even wearing them. Great choice of frames and great price...I'm happy with the quality. I would recommend this to my friends. I bought these for my brother and he loves them. I like that they called me for my information if it was correct and that they wanted to keep my information safe and did everything they could to help me out.! I do recommend this place.! Ordered these for my son and while it took a while to receive them, he could not be happier with the look and the quality. The prescription is perfect. Great value. The glasses came perfect. No flaws and very beautiful. I have never ordered glasses online until now. I was a little worried but it was quick, they followed up and told me when to expect my glasses. I will always do business with them.